Tell the truth: do you love ALL KINDS of weather? Or do rainy/foggy/cold/not perfect days prevent you from getting outside to play with your kids? A few weeks ago, I looked at the weather forecast on a day I was scheduled to lead my Con-T-GO Kids OT group: 100% chance of rain. I admit- I wasn’t feeling my usual enthusiasm about going out into the woods to lead the group that day. I reluctantly put on all of my rain gear - boots, rain pants, lots of layers, waterproof gloves - packed my backpack, and drove to our meeting spot while the rain came pouring down in droves. The kids in my group, on the other hand, seemed oblivious to the “bad” weather. They showed up in colorful rain boots and rain jackets, excited and curious as always. 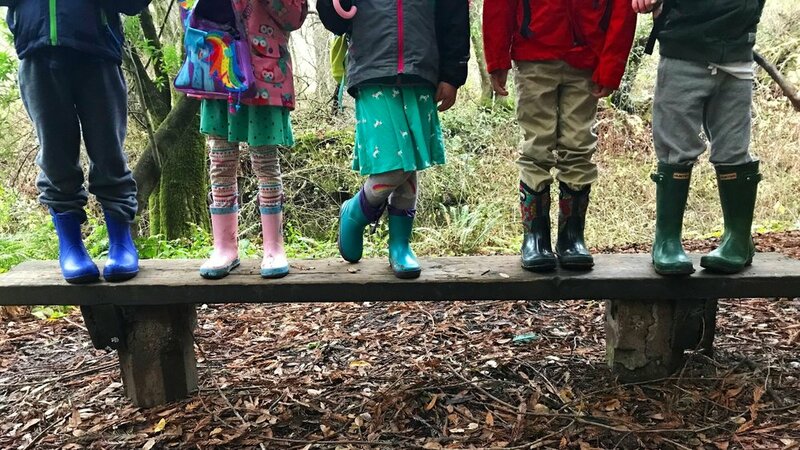 As we hiked into the woods we saw a large, graceful bird that we’ve never seen before, and the kids stomped and jumped in every puddle they could find. Joy all around...with the rain still pouring. Along the way one of the kids pointed out a large, old tree with low and thick branches just off the path. We set off climbing up a small hill to the tree...with the rain still pouring. The kids carefully planned and adjusted their movements while climbing up the muddy hillside and exploring the tree. One child who wouldn’t touch dirt or trees when he started our group put his hands on the ground to stabilize himself while climbing the hill, then wiped the mud on his pants without skipping a beat. The kids talked and negotiated when navigating around one another on the tree branches, being extra mindful of themselves and others because the branches were wet and slick. 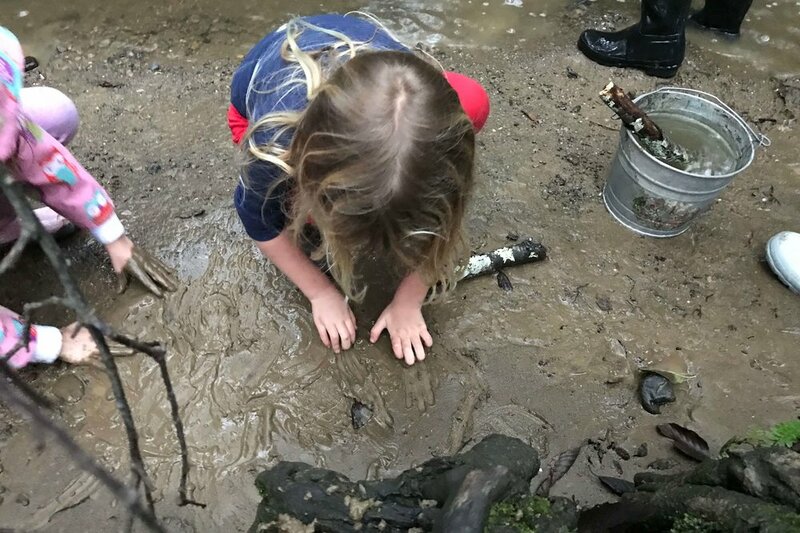 This was the magic of mud, of being outdoors with children, where they are motivated to explore, try, learn, play, and grow….all with the rain still pouring. Climbing the tree was the first of many magical moments that day where the kids initiated exploring and playing more than they usually do. I had planned several activities, thinking that the kids might be difficult to engage with all of the rain and that we might be going through them quickly. In the end, we only got to one of my planned activities, which was just how it should be, in many ways. The rain and mud engaged the children naturally in play. Children may easily internalize our (usually negative) adult interpretations of the weather. We can kill our children’s joy in wet weather play. As adults, we can be aware of how we communicate our own opinions about the weather to our children. If WE describe the rain as magical and mysterious, if WE express a sense of wonder about the weather, our children will be more motivated and excited to go outdoors in ANY kind of weather and play. Our children need to see it as a special treat to be outdoors in the rain. The rain reminds us to leave possibilities open, to not limit ourselves and others with preconceived notions, and to let things unfold naturally. When you go out in the rain with your child, you’ll enjoy having the woods all to yourselves. You’ll have peace and quiet, and experience a sense of wonder and appreciation of the natural world and seasons. There is nothing quite as beautiful as simply being present with a child during a muddy exploration of the woods in the rain. Let them lead the way. So next time it rains, go outside with your child, find some mud, and watch your heart overflow with joy when the magic happens...because mud is magical for us adults, too! Does Outdoor Free Play Still Exist in ANY Neighborhood in America?